Compare discounts for Casinos Hotels Motels Resorts in Las Vegas, Nevada! Viva Las Vegas! 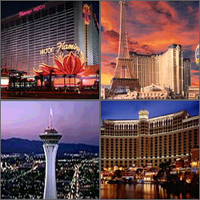 Las Vegas is the gambling Mecca of the world, a vacation paradise like no other and a premier business destination. It is a city thet really never sleeps. When you enter the world of glittering casinos with their 24-hour gambling excitement, reality 'takes a hike'. Las Vegas is a fantasy place where one can take time off from the real world. As a family vacation destination, Las Vegas offers the ultimate in entertainment for all ages. Where else could you visit Paris, New York, Venice and the Pyramids in one day? Play a round of golf at some of the top-rated courses in the United States, be pampered in a luxurious spa, or take the kids to King Tuts Tomb. As a business destination, Las Vegas wins hands down over any other city in the US with the number of facilities and services available. A multitude of upscale eateries are at your fingertips for a business lunch or dinner, and after-hours entertainment is plentiful and diverse. Las Vegas is truly the perfect venue to meet, entertain and close deals. Whether you're planning to move here, attend a business meeting, sky-dive, get married, or just relax and enjoy, you'll find Las Vegas to be a city like no other in the world. Experience the timeless elegance and world-renowned sophistication that can only be Four Seasons. Located just 17 miles from the famous Las Vegas Strip on Nevada's largest privately-owned lake, the Loews Lake Las Vegas is nestled on 25 acres of direct waterfront. The gorgeous Green Valley Ranch Resort and Spa is a fabulous, 300 million dollar luxury hotel located in Henderson Nevada, just 5 minutes from the McCarran International Airport and only 10-15 minutes by car from the Las Vegas Strip. Located at the heart of the Las Vegas Strip, Caesars Palace is a modern wonderland of luxury and excitement, and is widely regarded as one of the world's greatest hotels. Considered one of the most impressive sites to see in Las Vegas, the Paris Hotel is based on both turn-of-the-century and the modern motifs of the renowned 'City of Light'. Bally's Las Vegas is one of Las Vegas most elegant and exciting resorts offering guests a real life Las Vegas experience. Located on Paradise road, just seconds from the strip and right next to the convention center, the Hilton Hotel Las Vegas is a prime location for business and vacation alike. The Hard Rock Hotel and Casino is a unique, deluxe class hotel located two blocks east of 'The Strip' and two blocks north of McCarran International Airport. Welcome to the house that fame built. Hip, modern, decidedly dramatic, Planet Hollywood Resort & Casino is more than the newest hotel in town, it’s the shopping, dining and gaming destination of choice for the city that celebrates celebrity. The Harrah's Las Vegas is a deluxe, first-class casino and hotel located in the very center of the Las Vegas Strip. Superbly situated adjacent to the Las Vegas Hilton, Hilton Grand Vacations Club offers the closest all-suite accommodations to the Convention Center.